As I mentioned in my last post, I'm taking a break from scarves to try some new things. Here's a new vest I finished recently. I just love how the colors work together. 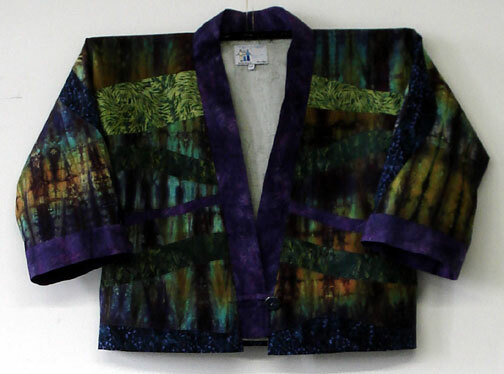 It's made from fancy ribbon and squares of hand-dyed silk chiffon. In winter I can envision this over a basic black dress or in summer over a cami when you need just a little something over your shoulders. The stitching and assembly were a little tricky to figure out the first time, but I was so pleased with the result that I knew I needed to make another one. This time I've done things a little differently, and so far it's been much easier. Look for more of these during our Holiday Open Studios in December or call or e-mail if you need one sooner. 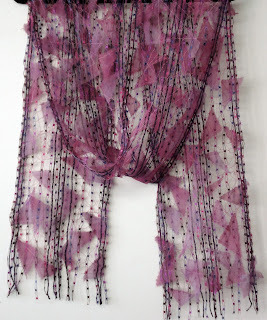 Here are the latest two Free Lace scarves in my inventory. 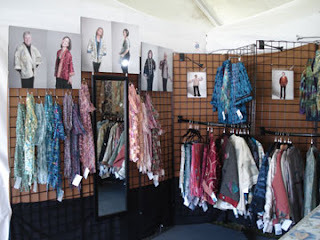 They are headed to Dahlia's Annual Scarf Show tomorrow morning. I've been having fun with items from my stash. These use some colorful ladder yarns given to me by my new friend down the hall Julia Farwell-Clay and bits of hand-dyed silk chiffon (the red violet) and charmeuse (the green and blue). As is often the case, Julia's "refuse" was my treasure. The yarns she gave me fit oh-so-well with other things that I wanted to use. It is so much fun to look through all the treasures to decide what will go together in the next project. These are the last scarves for just a bit. I'm experimenting now with some vests and tunics. More on that soon. Thanks for checking in. A lot of water under my bridge since my last post just after returning from the LNHC Craft Fair in Sunapee, NH. So much has happened that I have just not been able to stop to put fingers to keyboard. I spent a wonderful week on Puget Sound visiting my sister, brother-in-law and niece. My husband, son, daughter and son-in-law came too. We had such a good time hanging out together and seeing the sights. I made a couple of trips to Minnesota to be with my mom in her final days. During the first trip she rallied and we were able to share some wonderful memories. During the second trip she quietly slipped from this world and the family gathered to share more memories. Since getting back to my studio I've been creating more free lace scarves, rethinking the business model for Friends Fabric Art (more about that in another post), and getting my head back into my manager's role at the Loading Dock Gallery. It is a struggle sometimes to know where I am and what I am doing, but things are beginning to settle down again. 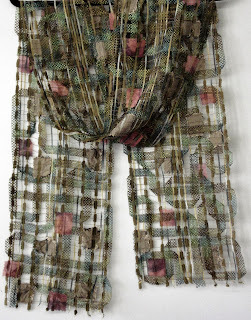 This one has great fall colors - greens and golds in the ribbons and bits of rust in the hand-dyed silk chiffon squares. This one has a bit of sparkle from silver metallic yarns and color from hand-dyed silk charmeuse & chiffon. After all the excitement of getting ready for and participating in the LNHC annual craftsmen fair at Sunapee, NH, I am having a fairly relaxed day in my studio. I haven't reset my display here or even set up my sewing machine again, but I have fully unpacked my car and stowed things away at least so I have moving and breathing space. As you may know, Sunapee was my first really big fair. It was a VERY good experience for me and I have so many people to thank for helping me through it. 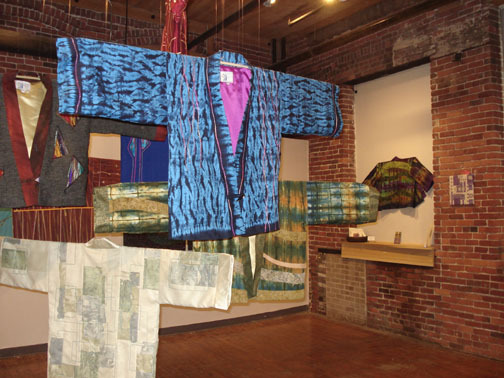 The Merrimack Valley Artisans really initiated me when I dipped my toes in the water at their show a couple of years ago. Several of their members who are also in the League of NH Craftsmen have continued to give me invaluable help and guidance. I wouldn't haven't gotten through this without them. Thanks Betsy, Tarja, Ritva, and Paula. 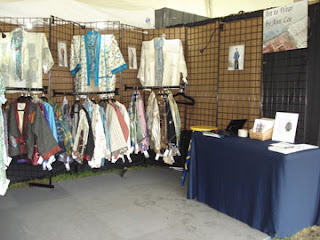 I also owe gratitude to all who stopped by my booth to chat, show support and to shop. It was much appreciated. I feel like I made so many new friends. And, I renewed some old acquaintances as well. On the third day of the show, the woman that I shared an office with back in the early 80s showed up in my booth. She'd seen my name in the program, noted my Lowell address and came to find out if indeed it was me. I'm sure it had been more than 20 years since we'd seen each other. It was definitely a memorable event. The photos of my friends and me attracted lots of attention and comment. People could tell that the models were my friends and that they were feeling good and having fun. They clearly got the message that I was making jackets for "real people." 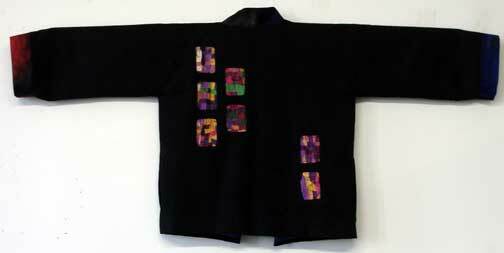 It was fun to change the jacket display on the back wall each day and to hear what people had to say about them. 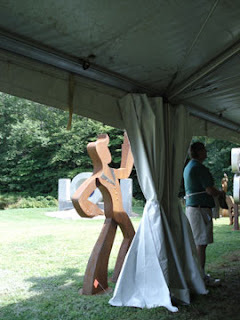 This great sculpture from Dale Rogers of Haverhill was right outside my booth. It lent a happy note to every day. I'd smile even wider when people stopped to pose by it and have their pictures taken. I'm kicking myself that I didn't have Dale pose by it. I think it really captures him. Here's the wider view from my booth. It was just amazing - and what was even more amazing than the view was the fabulous weather we had. It rained only 2 days out of 9 and neither time did it rain all day. 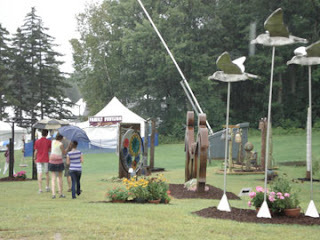 And as you can see from the picture, people enjoyed the sculpture garden even in the rain. When I sit down to begin my next blog post,the first thing I always do is to check in on other blogs that I follow. One of my favorites is Ann Williamson's. 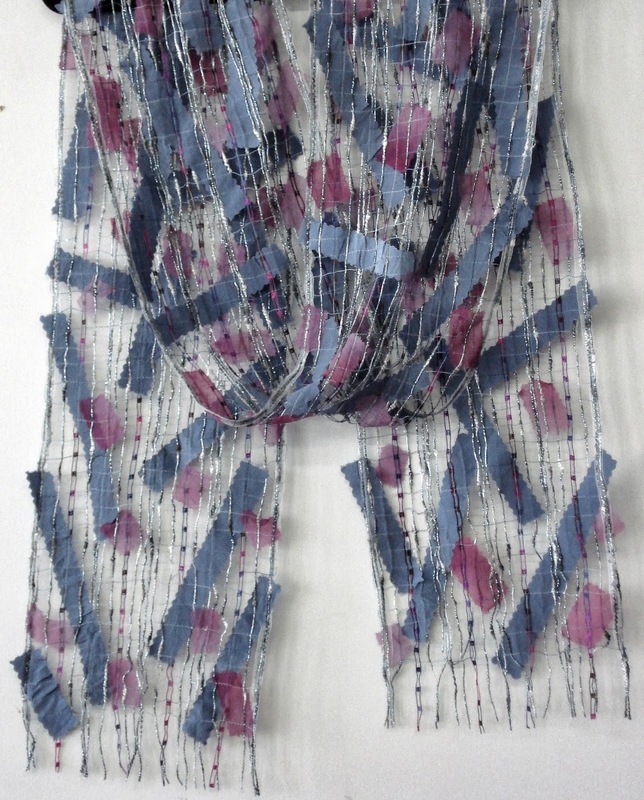 She also creates one-of-a-kind clothing and I find her work endlessly inspiring. I am definitely a fan. This time I felt a special connection to her as her most recent post was about spidery chrysanthemums and shows many designs incorporating these flowers. It touched a cord for me because today's post is about my most recent jacket which uses a fabric with these mums on it. It's only the most tangential connection--our work is very different--but I felt it nevertheless. I call this one Dahlias and Mums. Mums is obviously a reference to the colorful chrysanthemum pattern on the collar and cuffs. Dahlias is a subtle thank you to Dahlia Popovitz--a hand-weaver who has a lovely shop in Newton Center, Massachusetts. She carries my free-lace scarves. The last time I dropped off scarves, I came away with bags left-over bits of her hand-woven fabrics. The pieces were too small for her work, but were perfect for mine. If you look closely at this jacket, you'll see that most of the appliqued triangles are made of those fabric bits. 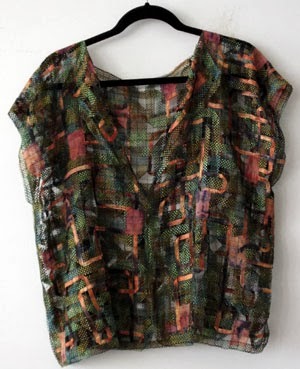 The background fabric for this jacket has an intricate woven pattern with great texture that seemed an appropriate setting for Dahlia's bits of color and glitz. I feel so fortunate to be the recipient of such wonderful gifts. And even on the inside. You can see this jacket and others at Western Avenue Studios First Saturday (Studio 304) at the end of the week, or visit me at the League of New Hampshire Craftsmen annual fair in Sunapee, New Hampshire the first week in August (booth C12 in the Emerging Artists tent). At the end of last week I moved all my sewing equipment to our lake house in Maine. We'll spend as much time as we can up there for the next couple of months. The lake views are distracting, calming and energizing all at the same time. My sewing machine sits on a card table in a corner of the livingroom with windows on two side. This time of year the water's still high so I feel like I could reach out and touch it right from where I sit. The view doesn't keep me from working though, and Monday I finished another jacket. 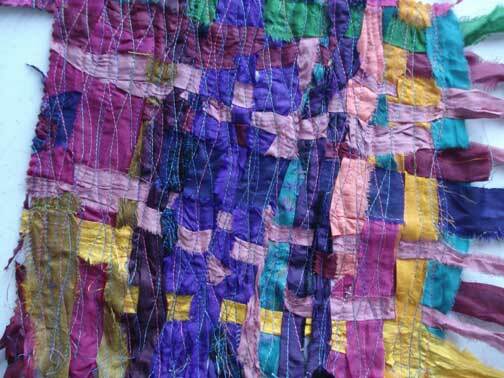 I incorporated insets of the recycled sari ribbon again in this one. I used the technique of laying the ribbons over an organza base and stitching them down till everything held together. This time I actually wove the ribbons together before stitching, but I hung onto my Wabi Sabi theme and left lots of crinkles and raw edges. 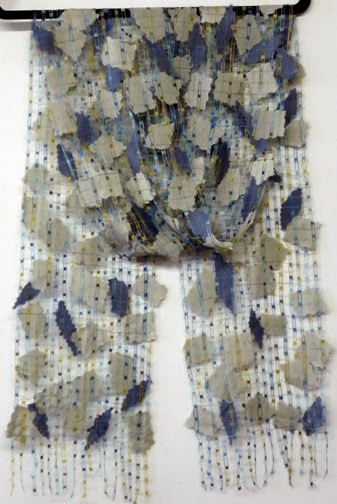 I also used quite a random weaving pattern based on how much of a certain color I wanted to show. Since I was going to stitch over all of it, I didn't have to worry about the weaving holding it together. Here's what it looked like before I started to cut it up. 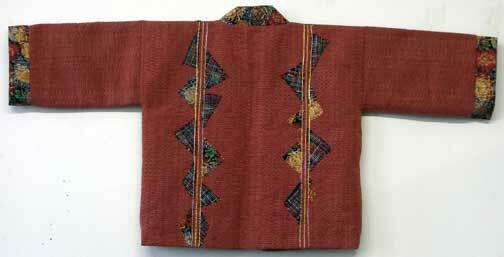 And here's the jacket with the inset pieces. This is the back. I call this one Sari Reprise. Tomorrow is the big day for me--the opening of our show at the Loading Dock Gallery here at Western Avenue Studios. 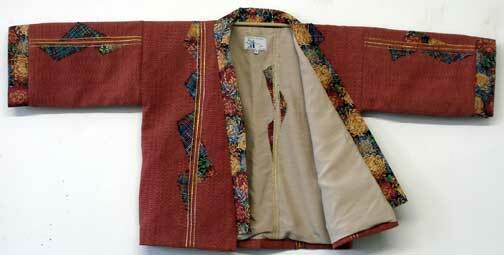 It's a joint show with Elaine Perra Renault who does these wonderfully intricate painted textiles. 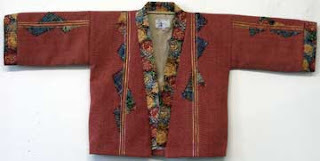 She starts with prequilted cotton which she "primes" with a base color; then she adds patterns in each of the little sections. All those tiny patterns add up to a larger design. I love her work and she's been a delight to work with on this. 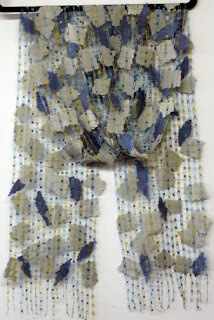 Our show title--Rhythm & Rhyme ~ Pattern & Texture--signifies both the process and results of our work. For me my work is visual music and poetry with an ebb and flow and repeating motifs. I'm pleased to share it. My contribution to the show includes both my jackets and my free lace scarves. I've been working hard to make sure that there are new works included that haven't been shown before. But even the ones that some may have seen before look new when they are displayed in a new way. It's very exciting. I hope visitors to the exhibit will see my jackets potential as wall art as well as wearable art. Here's a sample of Elaine's work - A large dyptich called Galaxy. You really must see it in person to get the full effect. If you are in the area, we do hope you'll stop by tomorrow for the reception, or later in the month. The show will be there through the month of June. For details, check the gallery website or Facebook page.